Soapy? Sticky? Bounce? What do these even mean? The Wrap Qualities glossary is here to help! Grippy/Sticky or Glidey/Slippery - Very similar to Textured or Smooth, but with a small twist. Grippy wraps have more "sticking" power; the passes can tend not to flow over each other as easily but the knots, oh the knots... they practically tie themselves and stay in place so well. Grippy wraps typically stay in place like a band-aid, with very little sag. Conversely, gliddy wraps make for passes that smooth over one another with ease, almost like layers of silk or chiffon. My 100% cotton wraps tend to be more gliddy than my blends, which are more grippy, but the wrap quality really depends on the texture of the weave, which is another way "textured" is different from "grippy:" texture is controlled more by the weave whereas grip is controlled more by the fiber. Saggy or Supportive - Saggy wraps do not hold their shape and quickly sag even though the passes have been thoroughly tightened. Supportive wraps can hold a lot of weight without changing shape. Stretchy or... not stretchy - Woven wraps have vertical and horizontal fibers. They do not stretch along the fibers but rather at a diagonal. Some weaves stretch more than others, the amount of stretch has to do with the weave and the fiber used. Bounce and Recoil - We'll just smoosh this right in between stretch and cush, because that's where I think it goes. Not all wraps with stretch have bounce and recoil, and not all wraps with cush have them either, but there's certainly a relationship at work in some degree when it comes to these three qualities (bounce/recoil, stretch, and cush). A wrap with bounce HAS to have stretch, and stretch typically leads to recoil (like springy pull-back). Diggy or Cushy - Diggy wraps are hard on the shoulders. Even with spread shoulder passes they can still dig. They feel heavy. Cushy wraps feel more marshmallow-y: they're fluffy and pillow-y. Moldable or Stiff - Wraps that conform easily to your shape are considered moldable; they feel like "second skin." Wraps may develop a moldable quality as they are broken in. Cotton wraps general start very stiff (the opposite of moldable) and take a considerable amount of time to become moldable or floppy (but when they do become floppy they are so worth it!). Stiff wraps will often form peaks in their pleats instead of making nice easy pleats. Floppy - closely related to moldable, but often even floppy wraps won't feel like "second skin." For example, very thick wraps can be floppy but never really reach moldable status. Floppy generally refers to the quality of a wrap after it has been broken in. The antonym to floppy is probably loom state but that isn't really a wrapping quality since loom state is gone after the first wash/dry. Thick or Thin - The thickness of the individual fibers will determine the thickness of the wrap as a whole. This is one wrapping quality that can actually be measured, and it is noted as gsm: grams per square meter (or gm/2). There's an interesting article on eBay (of all places) about gsm measurements for fabric. Soft - or not soft, not much to it. Dense or Airy - Can be confused with Thick or Thin, but this time we're referring to how closely together the fibers have been weaved. Dense wraps can be very heavy, feeling more like a tapestry. 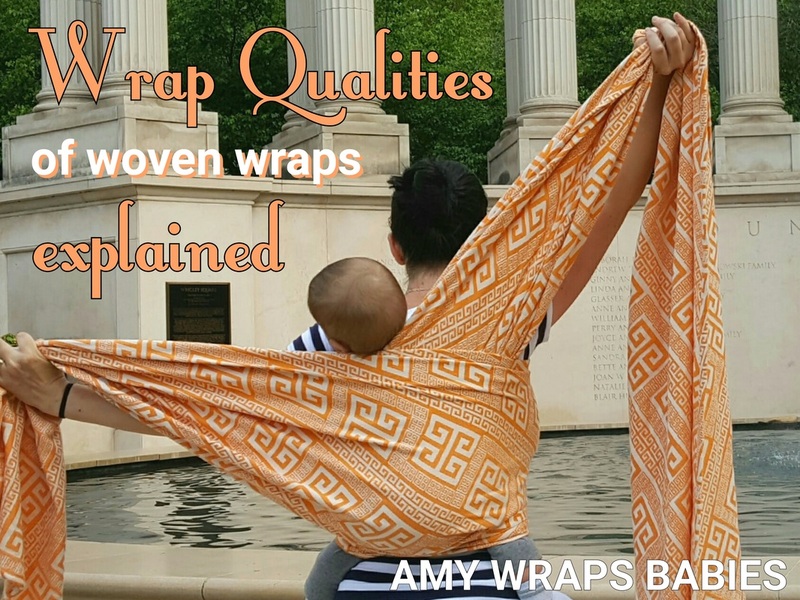 On the opposite end, airy wraps have a looser weave which usually makes them lighter and stretchier. Handwoven wraps are generally more airy with a looser weave, but there are plenty of dense handwovens out there too. Textured or Smooth - Heavily textured wraps feel maybe a little bumpy or rough in hand and the weave is noticeably bumpy or maybe looks like it has little pillows. In contrast, smooth wraps feel silky in hand. Smooth wraps easily slip through the fingers. Soapy or Dry - Soapy fabric has an almost slick feeling to it, like soap between your fingers. It is almost cool to the touch, whereas dry fabric feels more warm, almost brittle. There are soapy wraps with good grip and texture and others with better glide, just as there those qualities in wraps made of "dry" fabric. Soapy is also a quality that can develop in fabric over time as the wrap breaks in. I say "almost" a lot in those descriptions because these are really subtle differences in textile sensation. 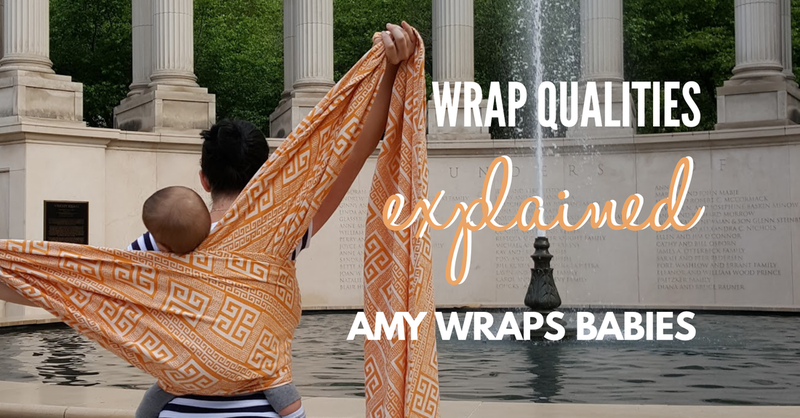 Start feeling your wraps with this description in mind and you'll probably start to notice the temperature and "slickness" of the fibers that you may not have noticed before.